BrassCraft has revised their full line of decorative plumbing products and accessories. BrassCraft's full line of decorative plumbing products and accessories now offer wholesalers a rich variety of finish options. Included are the company's highly-regarded water stops, connectors, faucet and toilet supply kits, escutcheons, cover tubes and many other kitchen and bath components. BrassCraft has revised their full line of decorative plumbing products and accessories, bringing wholesalers a rich variety of finish options for the company's highly regarded water stops, connectors, faucet and toilet supply kits, escutcheons, cover tubes and many other kitchen and bath components. Combined with a simplified, competitive pricing structure and prompt delivery, these special finishes mean wholesalers can provide trademark BrassCraft quality for a wider range of applications - quickly and cost-effectively. Due to high demand, BrassCraft has extended the availability of their polished nickel finish to cover a broader range of plumbing products. And the company will continue to offer their popular white, polished brass, and oil-rubbed bronze finishes. Wholesalers will also benefit from a low minimum order threshold, as well as express ordering and delivery options. With BrassCraft's well-known reputation for quality and innovation, backed by outstanding warranties, these special finishes provide the same value and peace of mind customers have come to trust when choosing BrassCraft. BrassCraft Manufacturing Company, a Masco Company, is a leading manufacturer of products for use in the new construction and repair/remodel markets. 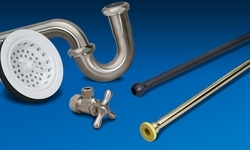 The company's motto: Committed to Quality-Driven by Innovation is reflected in the thousands of high-reputation plumbing products that are sold under the BrassCraft brand. Founded in 1946, BrassCraft has headquarters and manufacturing facilities in the U.S.A. For more information: http://www.brasscraft.com. For interview requests, or for a high-resolution image file, contact Jim Meloche at jimm (at) smith-winchester (dot) com (248.352.3333). BrassCraft Logo BrassCraft's full line of decorative plumbing products and accessories now offer wholesalers a rich variety of finish options. Included are the company's highly-regarded water stops, connectors, faucet and toilet supply kits, escutcheons, cover tubes and many other kitchen and bath components.